Yesterday I gave you a cloth diaper primer detailing all of the different types of cloth diapers. Today we’re going to take a closer look at prefolds, specifically the Real Nappies brand. I boiled and washed them to prep them, then dried them in the dryer which yielded soft, nicely quilted prefolds. I have the crawler size made for babies from 18-31 lbs. My son is just at around 18 lbs so these will last him through toddlerhood. I liked that these were narrower and more trim fitting than the other prefolds I own which is a huge plus when you have a little guy like mine. It is definitely generous enough to accommodate a bigger baby though as I rolled down the top for Jude. One of the best things about prefolds is they are easy, easy, easy to launder and store. Prefolds can take a beating and keep on going. Real Nappies guarantees they will last through 2 children or your money back in fact. My guess is they would last much longer than that though. There is no stuffing pockets. They dry up nice and fluffy and can be easily put in the sun to remove stains. There are also multiple ways to wear the prefold. Use a Snappi, pins, a prefold belt or just fold them in thirds and place them in your cover. If you use EC, you can place a prefold under your baby at night in case of a miss. They are also great for potty learning. 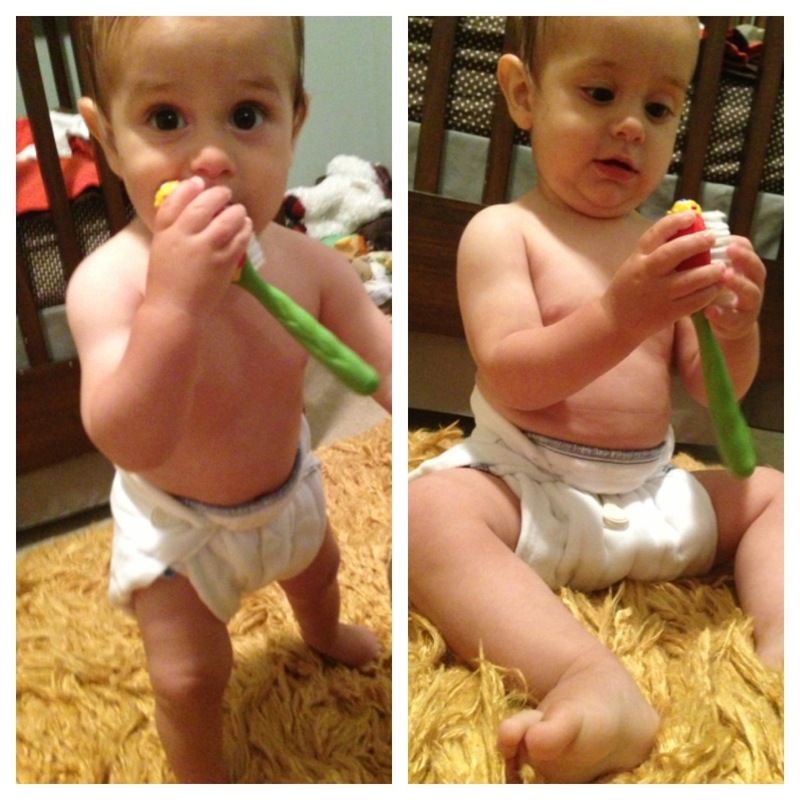 Simply use a prefold belt and let your child wear the prefold sans cover for quick on and off for potty trips. Your child can feel when they are wet and you can tell quickly when they are wet. Real Nappies is giving you a chance to win your own 6-Pack of Indian Cotton Prefold Cloth Diapers, Crawler Size, for babies 6-18 months, 18-31 lb. Entry is via the Rafflecopter form below. Good luck! Disclosure: I received no compensation for this post but did receive a complimentary Real Nappies 6-pack of Indian Cotton Prefold Cloth Diapers for the purpose of this review. I was not required to give a positive review and all opinions are 100% my own. I only review products that I either have purchased myself and love or products I have been given a chance to review by the company that I believe are products my readers would benefit from. 14 Responses to "Real Nappies Prefolds"
Having my first baby in November and looking forward to join the cloth diapering club!! 🙂 Prefolds and covers are what I’m looking to try first! looking into cloth diaper options, especially the prefolds. hope i win! I recently just started using pre-folds and LOVE LOVE LOVE them! They are so much easier to wash then a pocket diaper! Thanks for this sweet give-a-way! Haven’t gotten to try prefolds yet. Currently we are using pockets but we only have 7 of those for our 11 month old. Doing diaper laundry nightly is no fun. I just started using prefolds and would love to try the Real Nappies brand. I know a lot of people like aio’s but i love prefolds and covers or with wool!! LOVE this giveaway! PF were my favorite for newborns. We still use them on our 17month old toddler. We just tri-fold them and throw them in a cover! I had bought the newborn and the crawler nappies for my girls back in april…love prefolds, probably because my mom used prefolds on my sibs and me when we were babies. I, myself, put them on the two youngest with pins to boot. But my baby is starting to get too big for the nb’s so will have to buy the infant nappies.